I believe every person has a desire to fulfill a greater purpose in their lives. When I was in high school, I was exposed to many of the NPHC organizations. At that time I did not know much, however I was certainly intrigued to learn more. My freshman year on campus was a whirlwind, as for many! I immediately involved myself in numerous organizations on campus to be better acquainted with my new environment. What stood out was the involvement of the women of Delta Sigma Theta. They were small in number but mighty in representation. These women exemplified the way I wanted to be and held themselves to a high academic regard. So, as some wise women shared with me, "Do your research!" meaning, read about all organizations to ensure I know why I am pursuing and what stands out amongst the rest. My research made it even more clear and solidified my decision to pursue such a distinguished Sorority. 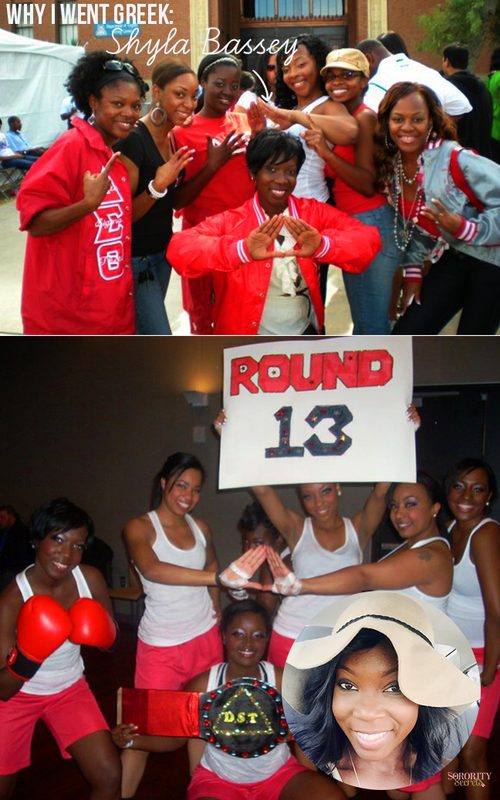 Joining Delta Sigma Theta Sorority Inc. was the best decision I've made in my life. Being apart of a bond with such an illustrious history of trailblazing women who have paved the way, so that I can press forward and succeed is priceless. How did your sorority develop you as a person? I went Greek because I knew it was in my heart to be apart of a sisterhood of women who carried similar ideals. I wanted to serve a greater purpose in my community, on my Campus and through my daily life. Joining Delta Sigma Theta taught me perseverance, humility, dedication, how to efficiently multitask, run a meeting, organize events, effectively delegate, public speaking, and never to quit even when things go wrong! The lessons learned truly could go on. Membership in Delta Sigma Theta Sorority Inc. does not end after college with alumnae chapters all over the world. If I could go back in time and relive my collegiate days, it would simply be spending time with my Chapter Sorors running the yard and hosting events on campus that served the greater need. Thanks for sharing your sorority experience, Shyla! If you have questions for Shyla leave them in the comment's section below! I heard both positive and negative things about sororities. Obviously the positives helped me determine whether or not it was the right fit for me. I heard non appealing things such as "you're paying for fake sisters" "sorority girls party and don't get work done." On the other hand, I also heard "you build life long relationships with your sisters" "sororities participate in a lot of community service" "there are endless opportunities to network" "joining a sorority is a great way to help build your community" ... and the list goes on. I have been fortunate to become a member of a phenomenal sorority of which I have had no negative experiences. I am blessed to be surrounded by likeminded women that achieve their academic goals while balancing extracurriculars, family and rendering service to all man kind. After learning about all values of my sorority that are so dear to me, I stayed motivated and encouraged to get through the process. In addition, my play grandmother has been a member of my sorority since 1971. All of her involvement within the sorority as I've seen since the time I've met her not only sparked an interest but was a reminder of the greatness that was yet to come. My favorite sorority moment was the day of my probate. I was so ecstatic for the world to see that my sisters and I are now women of Alpha Kappa Sorority, Incorporated. After we finished exams, our day was spent getting "fleeky" for our show. Sorority sisters that pledged before us traveled to see us. We were surrounded with loving women that helped pave the way for us and who are the epitome of true sisters. 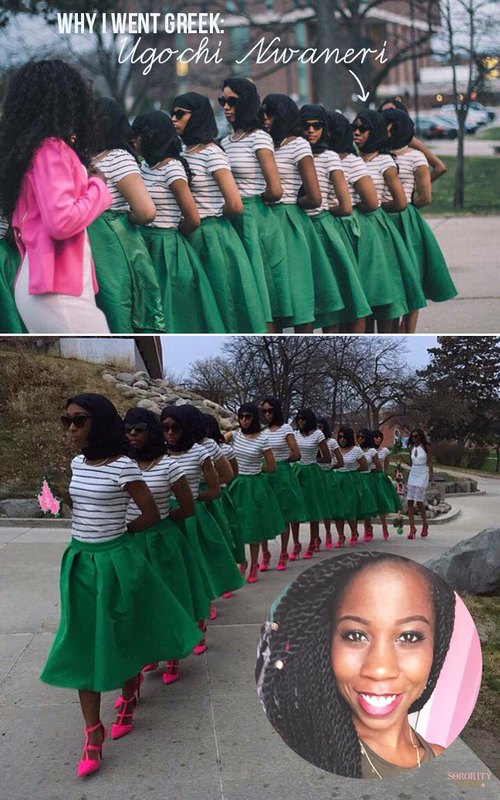 I will never forget the day of my probate- singing and marching through campus with our gorgeous green skirts and pretty pink heels. My advice for prospective members is to go to events pertaining to Alpha Kappa Alpha Sorority, Inc. and of course, get to know the members. I would also familiarize yourself with the criteria of becoming a member. Do you have questions for Ugochi? Leave them in the comments below! There are obviously all of those "typical" stereotypes of sororities that you hear in passing, see in the movies/on tv, etc., about the hazing, drama, mean girls, and paying for your friends. And to be quite honest I sort of believed all of that to be true. 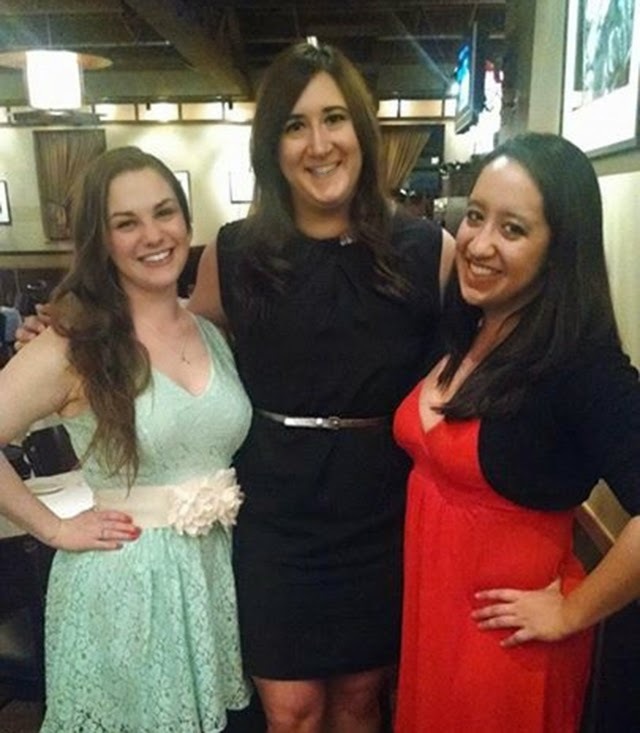 However, I had heard some positive things regarding joining a sorority before attending college from girls who had graduated before me from high school, who encouraged me to go through recruitment when I got to ASU, because they loved the camaraderie, the immediate friendships in a new setting, and the endless closets to be shared. Anytime you put 100+ girls in 1 room, there are going to be disagreements and personality clashes, but when it really came down to it, all of those positive things that I had heard were proven to be true. There was always someone there to lend an ear, or a shoulder to cry on, or someone to cheer you on or celebrate with you. And always, always, always clothing to be borrowed! I actually was out of town for formal recruitment weekend, so I attended informal recruitment a week or so after formal recruitment had ended. However, a friend of mine since childhood had joined a sorority and encouraged me to attend the informal recruitment events because within only a week, she had made friends, found girls in her same classes, had immediate lunch buddies, and a tote bag full of fun goodies. My best friend had also missed formal recruitment so we decided to go through informal recruitment together. Do you remember what you wore on Day 1 of recruitment? Please see above regarding informal recruitment, but I have absolutely no clue what I wore. But I wish that I remembered! When I attended the 1st informal recruitment event at the Kappa Delta house, there was this beautiful senior named Jenie who just lit up the room when she walked in. She was so friendly and made the awkward forced hangout seem natural and she kept the conversation flowing. She ended up becoming my grand big in the house and I recently watched her get married last summer. It's true when they say that these are the girls who will be at your wedding! It is so hard to pick only one favorite, but I would have to say my first night after moving into the sorority house my sophomore year. Me and my 3 best friends moved into a suite, which shared a bathroom and we stayed up all night dancing and singing at the top of our lungs in our pajamas, just bouncing back and forth between the 2 rooms. I remember the feeling of pure happiness and in that moment I knew I had made the right choice in Kappa Delta. I always infamously say that I would never go back to college because there is no way I could ever do it any better than I did the first time. But if I could go back, I would probably choose to go back to our senior year spring break trip. 10 of my sisters and I booked a cruise and spent 4 days at sea celebrating one of our last times all together before graduation approached. The trip may have only lasted a long weekend, but the memories will last a lifetime. After spending 3 collegiate years going through recruitment and another 2 years as an alumni behind the scenes of recruitment, I think that the best piece of advice is to treat recruitment like a job interview, and find the best fit for you. A lot of girls go through hoping that they will join the same house with all of their friends from home or from high school, but each house has it's own fit for each girl, and joining for any reason other than for yourself, may not result in the best possible fit for you. Just let loose and have fun with it. It's tiring and overwhelming, but every single girl there is tired and overwhelmed, on both sides. But if you trust the process and ask questions you will find the best fit and have the best years of your life! Thank you for sharing, Rhea! Be sure to also check out Rhea's awesome food blog called "Hot Dog It's a Food Blog"! This month is known as the month of sorority recruitment for tons of colleges and universities nationwide. Therefore, throughout the next few weeks, we would like to spotlight alumnae sorority women who went Greek and are thankful for going that route. These women will be from our Alma Mater, Arizona State University spotlighting various sororities from Kappa Alpha Theta to Delta Sigma Theta. We want to hear your stories and why being in a sorority has impacted your life in a positive way. Send your submissions and high resolution pictures of yourself and your chapter to secret@thesororitysecrets.com. Prior to going through recruitment, I was kind of a mixed bag in regards to my opinions about sororities. I had a friend with two older sisters who were both in sororities, and they always made it sound like so much fun. Then I read the book Pledged--it kind of freaked me out, but because I had heard so many of the upsides from close friends, I was able to step back and realize that a lot of what the media portrayed when it came to sorority life is a really an extreme example of what actually goes on. From the book? Not much. I think ASU is a school that does a great job when it comes to having a responsible Greek Life system and providing the fraternities and sororities with the support they need. You hear about these horrible things happening at other schools, but I can say with total confidence that I never encountered anything close to that during my time in a sorority! I went out-of-state for school and only had one friend I knew at ASU. I had plans to go out-of-state all through high school, and going through recruitment to meet new people was just another part of the plan! Ha, totally! I have a weirdly sharp memory. I wore a lime green tank top, tan shorts and gold Steve Madden sandals. Chic. Probably my Rho Chi! I did some snooping and figured out she was a Theta (I know, you’re totally not supposed to do that), and from that moment I knew I wanted to be a Theta as well. When I was a sophomore and living in the house. One night we were all majorly bored, just sitting around the chapter room when someone came up with the genius idea of heading over to the fraternity houses to steal composites. It was really late, and we were able to sneak into about 4 different houses and raid their composite walls. When we got them back to Theta, we didn’t even have anywhere to put them, there were that many. Probably that night. I did it with my very closest friends in the house and we’re all still in touch. Either that or Barn Dance. Barn Dance was always so fun. Don’t take it too seriously! You want to find a house full of girls who like you for you, not for who they think you are. 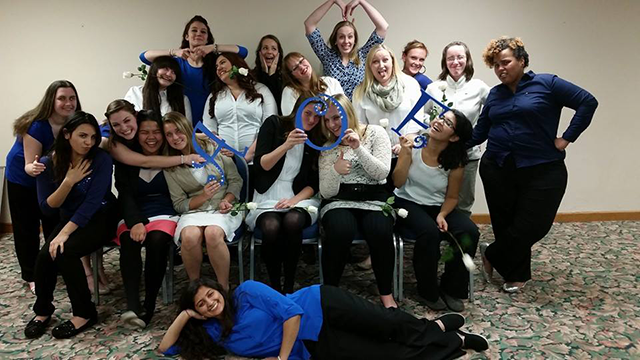 We wish you all the best of luck as you embark on recruitment. 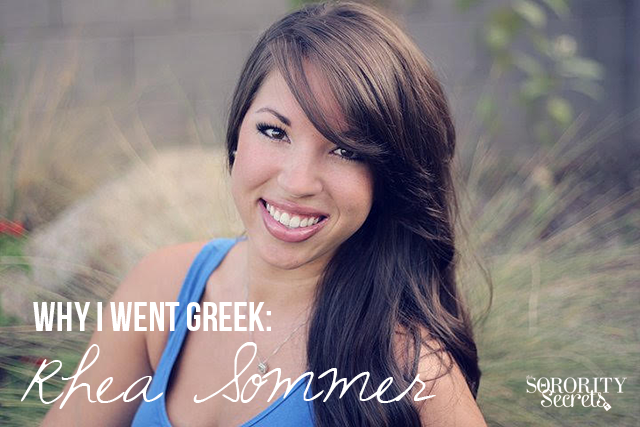 Check back for more interviews on fellow sorority alumnae! With graduation around the corner, we wanted to highlight our graduating sorority women and tap into why they decided to "Go Greek"! 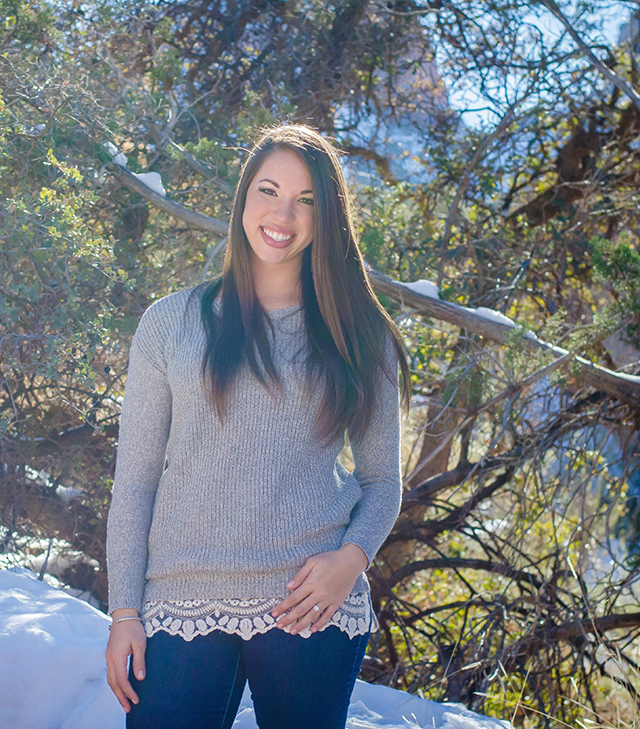 First up, meet Megan Sieg! When I transferred to Northern Illinois University, I didn't know anyone, but that all changed during my second semester. I always knew that I wanted to go Greek because I wanted a sisterhood like my mom had with her sisters. I went through formal recruitment that fall, but I didn't get to meet all of the sororities because of conflicts with marching band, and none of the sororities I met were quite the right fit for me. 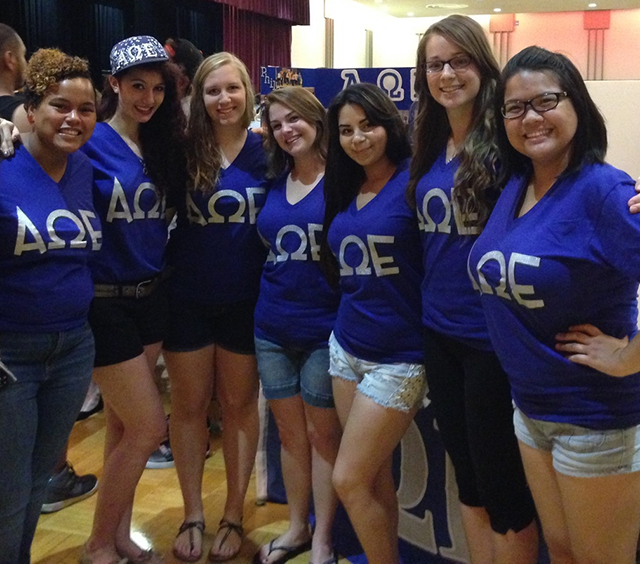 The following semester, I stumbled upon Alpha Omega Epsilon, and my life changed. I gained a big sister who has become my best friend, three littles, three grand littles, two great-grand littles, one great-great grand little, and several other sisters who I can count on for anything. I became a leader and someone newer members can look up to, and I learned to embrace my quirks and inner nerd and be proud of the things that make me who I am. Because of my sisters, I found myself and became the confident, driven, and independent woman that I am today. Are you graduating and you want to share your story on why you went Greek for a possible feature? Then, email us with your story and 3-4 high resolution, unfiltered photos to secret@thesororitysecrets.com! Ever since I found out what a sorority was, I wanted to join one. My love for all things Greek started in about 2001, when I was first introduced to a character named Elle Woods. She was smart, beautiful, sassy, and looked smashing while wearing pink. Then in 2002, my love was confirmed when I watched the show "Sorority Life" on MTV. Does anyone remember that show? It completely intrigued me. What was being in a sorority all about? Who were these people, and more importantly-- what sorority were they in?! It boggled my mind that the Greek letters were blurred out during the entire show, and I Googled relentlessly until I could find out which organization this show was all about. There was so much drama, there were so many twists, and I spent so many hours glued to the screen. But that was the movies. That was made for TV. As I left high school, I chose to stay in-state and attend Arizona State University. The campus looked beautiful, there were many great shops and restaurants nearby, and Mom wasn't too far of a drive either when I wanted a home-cooked meal. Plus they had an excellent Journalism & Communication program, so I was sold. Even though I stayed in-state, a funny thing happened... NONE of my friends from high school chose to go to ASU. They all either chose the rival college in Arizona, or to go out of state. Big gulp... I was a lone ranger. I was on my own to find a new circle of friends. There was no question; I was going through sorority recruitment. I signed up, and went shopping for outfits to wear to recruitment immediately. Once Bid Day rolled around, I had lunch with my Mom by campus just before the big event. As I sat there talking to her about my experience over the past weekend, I started crying. I fell in love with the chapter I wanted to be in, and the connections I made meant so much to me... I cried just thinking about it. The women in this chapter were ones that I identified with, looked up to, and were in alignment with my values. Tears of happiness, I found my home. And a few hours later, I found out that my wish came true. As my first few years of college flew by, I was swept away in Greek pride. 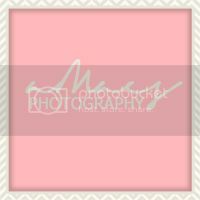 I was so proud, that I painted our sorority name in neon pink spray paint on the wall of the spare bedroom where 3 of my sisters and I lived together. Oh, and my car had a 3 foot wide decal on the back window too (in pink, with hearts). I got involved. I held positions, and they forced me to take action to improve my leadership skills... and get out of my comfort zone. As one who liked to do things typically all on their own, I learned how to delegate and trust in my sisters to help me get the job done while I was recruitment chair. One late night while living in the house, I bonded with a new friend in my pledge class. We laughed, we cried, and we were inseparable from that day forward. I was there the night she met her future husband at a fraternity house. And, she stood beside me as my Matron of Honor at my wedding 3 months ago. And then there was that one time I got in trouble... oh boy. Now I could leave this story out, but I'm keeping it real... this humbling event was key to my experience. While I thought I was having an innocent party one night, it didn't exactly play out that way when I got called in the following week. Some of the new members were at the party, and our advisors weren't too happy with me. I was so upset with myself, I cried for days. But you know what? It taught me a lesson. I learned how to better look out for my friends, my chapter... my sisters. How, you might ask? Because it was up to people like me to ensure the chapter I loved stayed that way; it's the older members' responsibility to guide the new members in the right direction. Sure, we had fun. But sisterhood to me wasn't about a party. Often times, it was the nights hanging out on the couch that meant the most. Suddenly, I saw the bigger picture & a lightbulb went off... it all made sense. Once things calmed down, I realized that my sisters cared enough about me to call me out when I was doing something wrong. I respected them for doing that. That's exactly what happens while you're in your early 20's; you grow up. Now I'm not suggesting to go out there and be reckless, but it's ok to make mistakes too. Being Greek holds you accountable, and reminds you to respect the values that made you fall in love with your chapter in the first place. Thank goodness I had my sisters by my side to experience the growing pains together. Those 4 years wouldn't have been close to the same without them, and I can't imagine it happening any other way. And as I continue to grow for the rest of my life, I know that they'll be right there with me for the ride. Today, the pride I take in being Greek has taken on a new meaning... beyond any massive sticker I could place on the back of my car window. I can say with my whole heart that choosing to go Greek is one of the most important decisions I've made in my life. I met my bridesmaids, it challenged me as a person (and made me a better one), and I've built a career for myself out of something that I hold so dear to my heart. It taught me to be a better friend, a better leader, and a better woman. I even attribute my decision of going Greek to meeting my husband; if it wasn't for the people I met in my sorority, I might not have ever met him. After graduation, being Greek takes on a whole new meaning... when you meet another woman who is also a Greek alum, it's instant common ground (same organization as you or not, it doesn't matter). I'm fortunate that I get to stay connected to Greek life through both The Sorority Secrets, and through my company 224 Apparel as well. Even after I've graduated, I'm able to give back to something that has given so much to me... and it gives me true joy. I believe in sorority women. They are among the most powerful, influential, and caring people I know. It's an honor to be a part of such an organization, and part of a legacy of remarkable women. I'll be forever proud to be a Greek woman, and grateful for my decision to Go Greek. 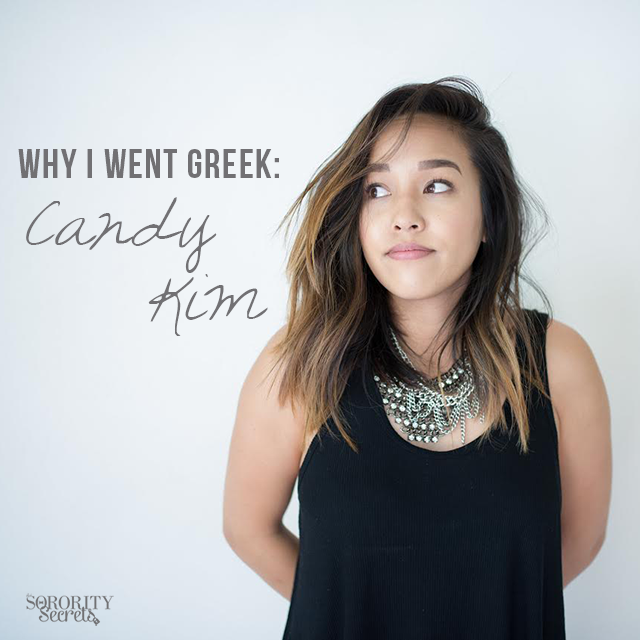 Yesterday, we highlighted why Co Founder, Sakura "went Greek" Today, find out why Co Founder, Karen "went Greek"! My story is really unique in the sense that I knew absolutely NOTHING about sororities. I of course heard about them via movies, but didn't quite understand it. Here is a little background on me. I am Nigerian-American. I was born and raised in America, however, both of my parents are Nigerian. As my parents assimilated to the American culture, we were brought up in a predominantly Caucasian neighborhood. The majority of my friends were of that race and as I continued throughout junior high and high school I tried to diversify my circle of friends, however, I yearned for more African-American girlfriends. As I entered into my Freshman year of college I had heard about sororities that fostered young African-American women. Eager to learn more about it, I went up to the Greek Offices. When I went up to the Greek Offices toward the Non-Panhellenic area, no one was there. However, across the way in the Panhellenic area stood a tall, black woman. She said, "Can I help you?" I then let her know I was looking to talk to her about joining a historically black sorority. The tall, black girl further introduced herself as Kiara and politely asked if there was a reason why I wanted to join the all black sorority. I gave her my spiel that I explained earlier and she then stopped me and said, "Karen, I am not in an all black sorority and I have made some amazing relationships with women who I call my sisters. We have all races in my sorority, even black women. At the end of the day, it shouldn't be about the race of girls, it should be about where you feel most comfortable ". Kiara had a great point. To be honest, I have never defined my life by race. For those who know me, I have a diverse circle and seek to learn the person BEHIND the skin shade. While I do believe that there are some things similar races can vibe on, I prefer to surround myself among all walks and colors of life. Kiara then suggested that I participate in the Panhellenic recruitment which happened to be that weekend--I had nothing to lose as the historically black sororities were not looking for new members until the next semester anyway. I figured if the recruitment that weekend didn't work out, I still had the opportunity to check out the historically black sororities. Long story short, going through recruitment that weekend was the best decision of my life. I met women who I could relate to on all levels and they helped to shape my positive college experience. From holding various roles like Recruitment Chair, Social Chair, and choreographing fun philanthropic dances, I was able to practice my leadership skills and overall have a blast in college. Above all else, without my sorority experience I would not have met Sakura and Ali to start The Sorority Secrets. For that, I am grateful. 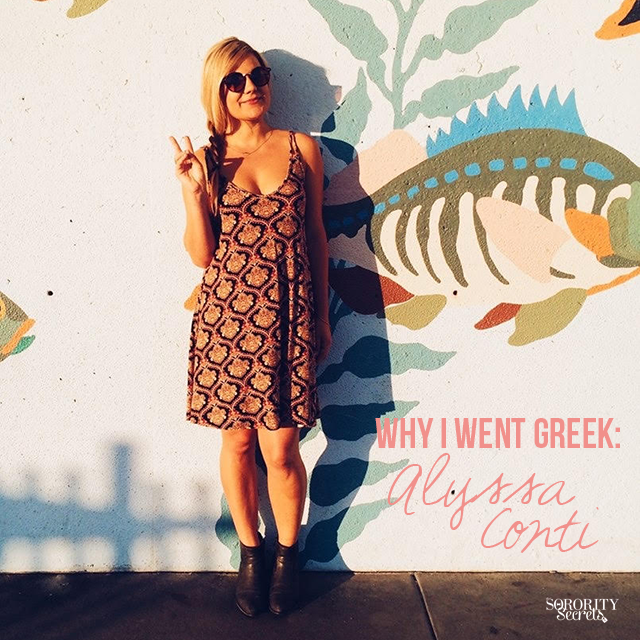 What's your positive story on why you went Greek? Share with us below! This week we wanted to highlight each of our individual stories on why we went Greek in lieu of many of you going through recruitment right now. First up, Sakura! 6 years ago, I made the best life-changing decision I have ever made and yup, you guessed it… I went Greek. To be honest, Greek life was a complete mystery to me. None of my family members were ever apart of Greek life and my hometown college, University of Nevada-Reno, wasn’t very big in Greek life at the time- so I really had no idea what it was all about. 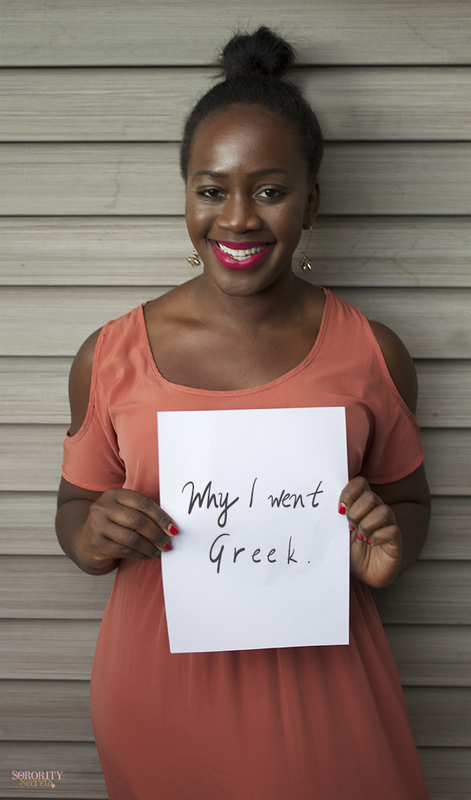 I knew that Greek life can be negatively stereotyped at times, but I knew that there was so much more to it and I had to find out for myself. I grew up in a small town in Northern Nevada where everyone knows everyone, so when I decided to go to Arizona State University, I knew that everything was about to change. As I made my move to Arizona knowing no one, I was a little nervous as to how I would make these next four years in Arizona my new “home”. I was an out-of-state student with a random roommate in an apartment, because I was not “comfortable” living in the dorms (huge mistake). All I can say is that I was eager to find new friends and fill that hole in my heart of not being with my family and my childhood friends. I remember the first week of my freshman year like it was yesterday- getting lost on campus, walking from class to class by myself, and eating alone at the Memorial Union. It was awful, but little did I know that it was all a blessing in disguise. During my first “miserable” week, I had my first encounter with what being in a sorority was all about. 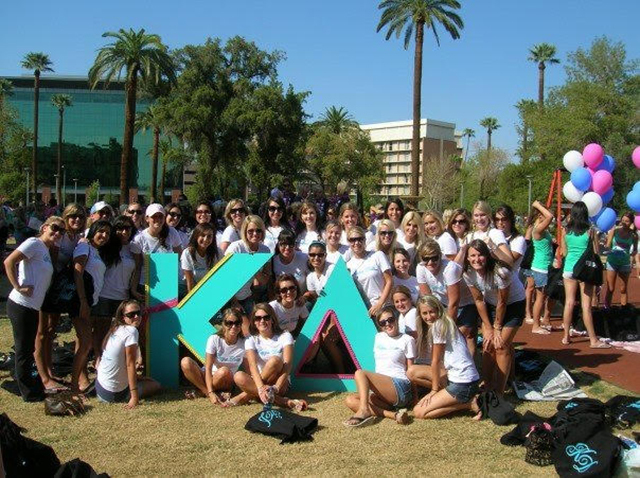 The first week of school at Arizona State University is promo week for Greek life and all the sorority women are wearing matching outfits with their letters on it. I easily recognized which girls were apart of Greek life and saw these sorority women walking from class to class together, eating lunch, and hanging out between classes. It was everything I wanted. I registered for recruitment that day and was looking forward to that following weekend for recruitment to start. Looking back, recruitment was sort of a blur- it was a whirlwind to say the least. I remember being torn by two sororities, but I thought long-term. I loved the women in both of these sororities, but one of them seemed like the typical “fun” sorority, while the other seemed a little more… me. I really wasn’t sure what I was supposed to do- do I go outside of my comfort zone or do I stay in my comfort zone? Which group of women could I rely on when something bad happens? Who will I feel more comfortable with? Those three questions lead me to my new home, my new friends, and my new family. I joined the sorority that was for me and nothing else. It has been 6 years since I became a part of Greek life and I wouldn’t be where I am today without it. I have met the smartest, most hardworking women and they have inspired me in so many different ways. Without being apart of a sorority, I never would have met my sisters and now business partners to start The Sorority Secrets either. The only thing I can advise to those going through recruitment is choose the house for you- not because you’re a legacy, your friends’ decision, or the reputation of the house. Do it for you and everything else will fall into place!